Valuable information that nobody has seen exists in a database. MAPIN allows you to see the valuable information anytime you would like. 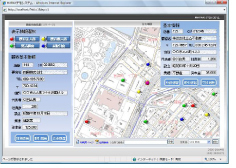 Web map information system (Web-GIS) development tool "MAPIN AX" is now on sale. Though a great majority of GIS engines are made in Europe and the United States and translated into Japanese, MAPIN contributes its technical capability to society through this rare GIS engine, genuinely made in Japan. Since we own the patent, we would appreciate your consideration in purchasing our GIS engine. MAPIN AX is ISAPI that was developed to structure GIS on the intranet. MAPIN AX utilizes XML technology and has a command to edit as well as to refer and analyze. Based on the accumulation of experience and technical capabilities, this innovative, unrivaled, WebGIS has become reality. The following is one example of GIS scale map data structured by MAPIN AX. The following is a part of actual record samples of MAPIN AX implementation. This allows you to visually recognize clients' locations or hidden geographical characteristics of the area by connecting existing data that financial institutions have, and showing scattered icons on the map. Clients can prepare for a visit or find out where you have not visited for a while, as the icons on the map can show the information that is in the system, which connects with the client's transaction and sales history. Since the data is shared between headquarters and sales stores by the network, we can pay close attention to sales campaigns. Thus it is very effective at a sales promotion, as the current status can be confirmed on the map from any computer terminal.